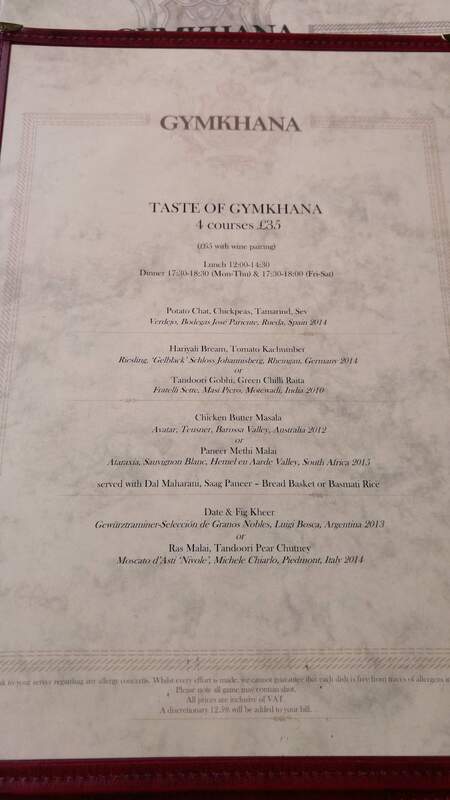 Gymkhana is the sister restaurant to the successful Trishna, both of which boast a Michelin Star. 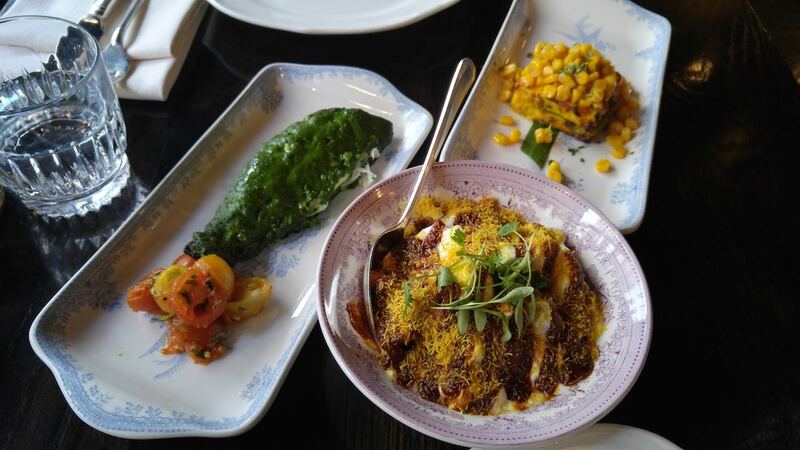 I visited Trishna a few months ago for a Sunday lunch and really enjoyed it and wanted to check out what the newer Gymkhana had to offer. I originally wanted to visit after work but getting a table here is not easy! Every day that I wanted was booked up for weeks but I managed to check a late lunch slot on a Wednesday which was in line with a day I had off so I booked straight away. From the moment I made the online reservation the great service began. From email confirmation of the reservation, followed by a reconfirmation the day before which asked if I was celebrating any occasion, which I was, I was taking my friend out for her birthday which I mentioned, the reason I am mentioning this will follow. 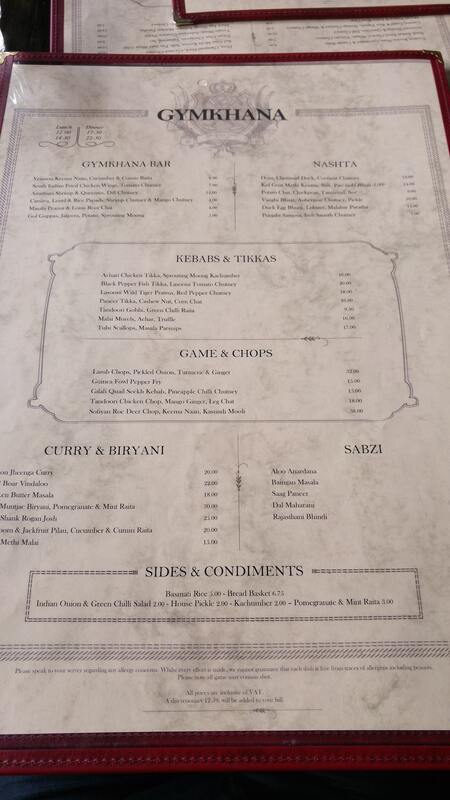 Gymkhana is located near green Park, the décor and theme of the early is that of an old Indian colonial gentleman club, similar to Dishoom if you have been. There two floors, the lower floor is reserved for a different menu I think and is more furnished compared to the main floor where I ate. Okay, lets talk about food! Having booked a table for 2 at lunch, i wanted to take advantage of the set lunch menu. There were 2 different set menu that i could chose from so I decided to pick 1 of each, as each menu had different items to mix and match from. 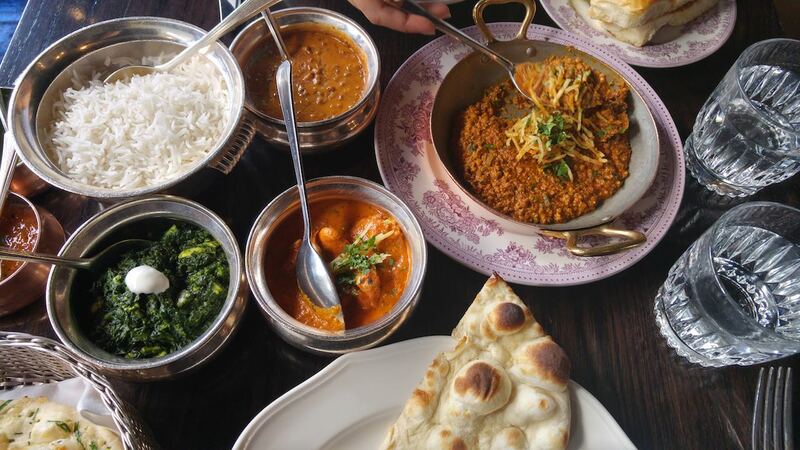 TASTE OF GYMKHANA – 4 courses for £35 and GYMKHANA LUNCH MENU 3 courses for £30. 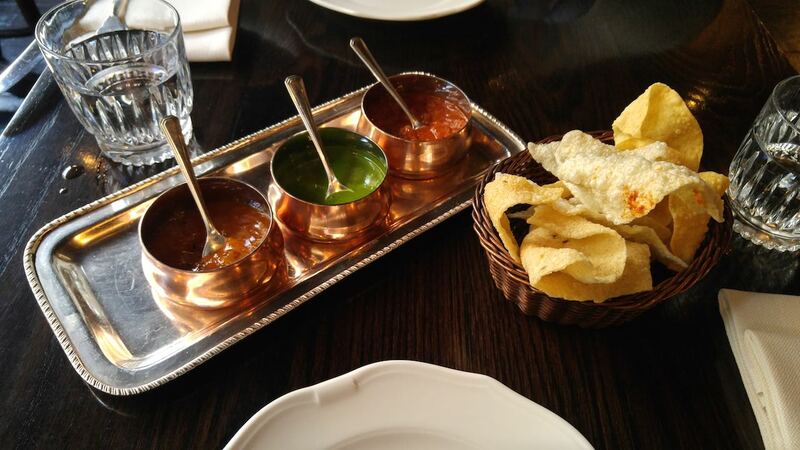 We started with some poppadoms – Cassava, Lentil & Rice Papads, Shrimp Chutney & Mango Chutney. This was really good, the balance of flavours and the texture was just perfect. I was really impressed with this starter. A bit on the dry side and it didn’t really wow me. A piece of fish covered in a green sauce. I was a bit sceptical at first but this dish was great. The fish was perfectly cooked and the spices it was cooked with really blended well all the flavours. 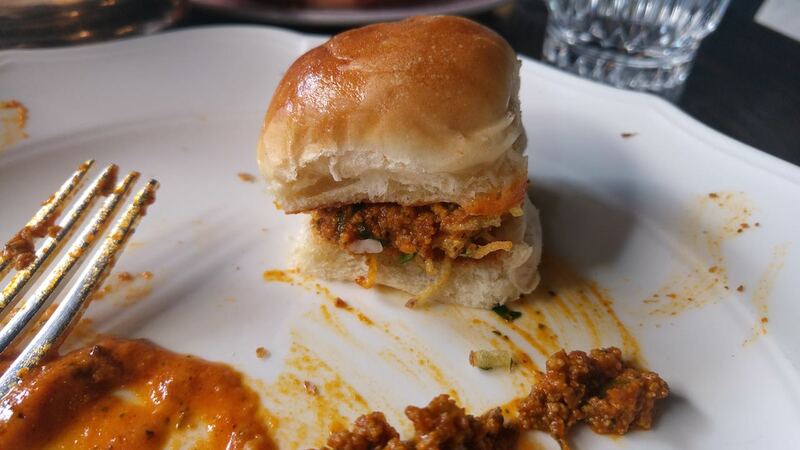 There was an option to have the keema served with lamb brains as well, we decided to pass on this choice. But the keema was again another well made dish. It was light and the spices used really brought it to life. At this point, i found my nose running a little from the heat from the chilli. I was impressed that they didn’t dumb down Indian food for an “English” tongue and kept true to how the food is meant to be cooked. 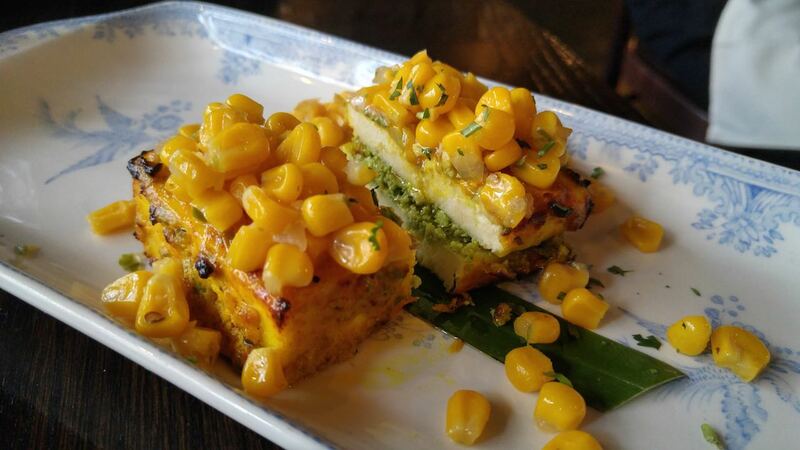 This dish wasn’t that memorable, im writing this review a week after my visit and i am having a hard time to recall the how this dish tasted, clearly it didn’t leave much of an impact. By this point we were pretty full. But I left some room for dessert. For which we ordered Blackberry & Apple Falooda, Berry Ripple Kulfi and Date & Fig Kheer. My friend was also surprised with a birthday dessert as well. When our desserts came i was wondering if they do anything for my friend as it was her birthday and the table next to us got a birthday dessert, when i looked up the manager just looked at me and winked, from that i knew that she was gonna get one as well. From start to finish everything from the service to the food was on point. The staff were very attentive and helpful with ordering and explaining dishes. it’s what you expect from a Michelin stared restaurant. 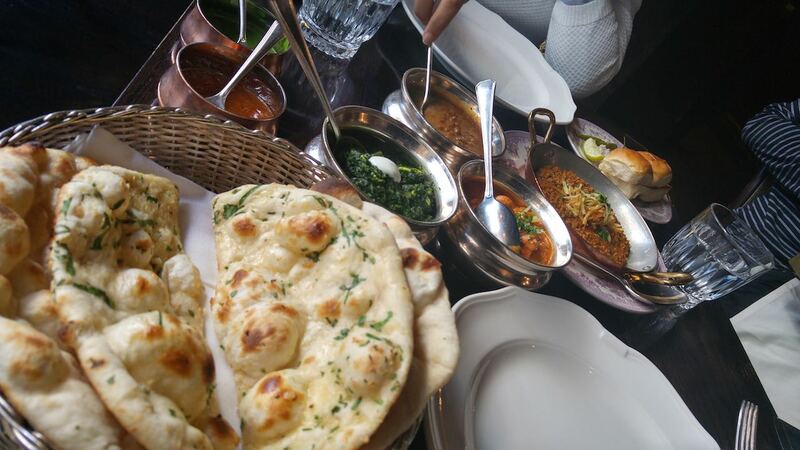 The food was really good as well, its not a curry house that’s for sure, the standard of cooking, service and environment reinforce this. Hey Buddy!, I found this information for you: "Gymkhana". 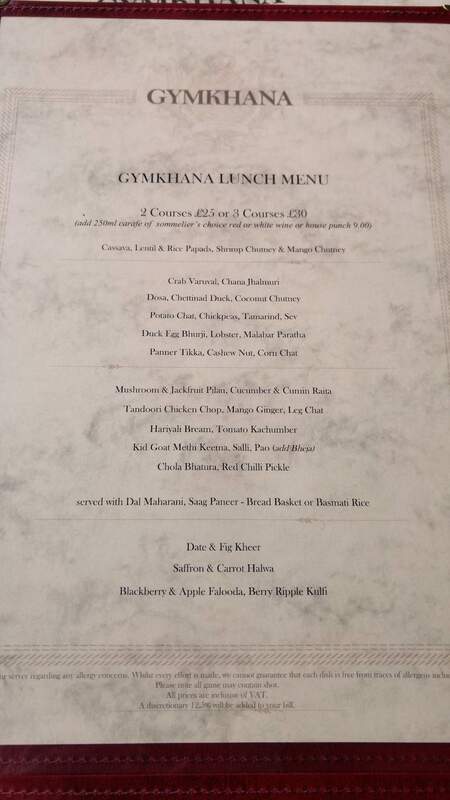 Here is the website link: http://halalfoodguy.co.uk/gymkhana-lunch/. Thank you.